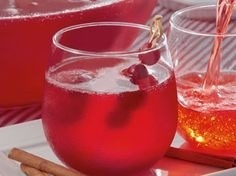 Blend the cranberry sauce, frozen juice concentrates, and spices into a blender on low until fully incorporated. Transfer the mixture into a large mixing bowl. Add the water to the mixture & mix until the water is fully incorporated. Split the mixture between two 1- gallon freezer bags and place into the freezer. After 2 hours, knead the concentrate inside the bag and replace into the freezer overnight. To srrve, thaw the mixture in the freezer bag until it can be easily scooped. Place 1/2 cup of slush and 1/2 cup of sierra must into a cup. Garnish with fresh cranberries and cinnamon sticks.